4003 (basic kit) + 4202 (upgrade kit) = 4002 (SuperShort KIT). When the 4003 and the 4202 are added together, you get exactly the same parts as you do with the 4002. 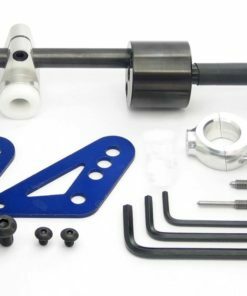 New from GFB is the STi 6-speed Short Shift Basic Kit (part # 4003), which has been designed as an infinitely more affordable alternative to STi’s own aftermarket shifter. It is derived from the popular and unique GFB STi short shifter (part # 4002), which consists of two main parts; the gear lever and the linkage clamp, which work together to allow shift-throw adjustment over the largest range of any shifter on the market. The new Basic kit utilizes the adjustable gear lever from the 4002 kit, without the linkage clamp. This means the Basic kit allows shift throw adjustment, but over a smaller range. Importantly however, it is easily upgraded to the 4002 kit with the addition of the linkage clamp. So why choose the Basic over the 4002 kit? When using the full 4002 kit, some people find that the shorter settings are actually too extreme for their taste (particularly on MY06-08 models, as the factory shift is shorter than earlier versions), and only end up using a small amount of the shifter’s range. In such cases, the Basic kit gives the same result at a lower price. 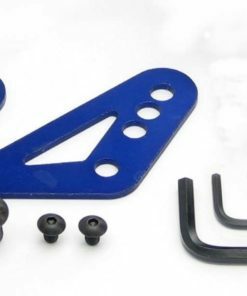 If however you decide that you want to go shorter, you can always purchase the linkage clamp separately and upgrade to the full 4002 kit at a later date – it really is win-win! As with the 4002 full kit, installation of the Basic kit is all done from within the car in about 30 minutes, and is made all the easier with the inclusion of GFB’s brilliant and unique pin-press tool – when you use it you’ll know why we included it and wonder why others don’t! So how much shorter is the throw? The GFB Basic kit is adjustable from the factory setting down to around 32-35mm per gate (depending on year model). Add the linkage clamp and the possible throw range drops to a miniscule 20-22mm (see photos opposite – these show the factory shifter vs the GFB full kit on a 3rd to 4thgearshift)!